Please fill out the form to download our Main Product Catalogues. Which of the following catalogs are you interested in? Steel pipe is an inherently efficient structural component. It is strong, has no sharp corners, and is readily available worldwide. The difficulty in using steel pipe to form structures arises when joining. Threaded pipe must be supplied in set lengths making for zero flexibility in installation. Welding is labor intensive, requires a highly skilled workforce, and specialized equipment. The answer is KEE KLAMP® components. The underlying principle is simple but highly effective: use slip-on components to create versatile and rigid tubular structures. The Kee Klamp® principle has been developed and refined for more than 75 years resulting in an extensive range of components suited for any need. The simple but effective engineering principle of the Kee Klamp® fitting is the foundation of the most versatile pipe connection system available. There are many variations of fitting to suit a wide range of applications, thus providing the versatility to achieve virtually any structural configuration. Kee Klamp® fittings are iron castings manufactured to the requirements of ASTM A47-77-32510. A range of fittings to suit eight sizes of pipe is available. Hex set screws firmly lock the pipe into the fitting. Set screws are manufactured in case hardened steel and are protected against corrosion by Kee Koat®. A Kee Klamp® fitting (size 5 to 9) can support an axial load of *2000 lbs. per set screw with the set screw tightened to a torque of 29 lbs./ft. This is normally obtained when the set screw is fully tightened using a ratchet wrench. The simple but effective engineering principle of the Kee Klamp Fitting is the foundation of the most versatile pipe connection system available. There are many variations of fittings to suit wide-ranging applications, providing the versatility to achieve virtually any structural configuration. Kee Klamp fittings are generally made from cast iron* and are manufactured to the requirements of EN 1562 & EN 1563 and galvanized to the requirements of EN ISO 1461. A range of fittings to suit eight sizes of pipe is available. A simple hexagon key is the only tool required to create a strong, rigid joint. A recessed grub screw tightened by the hexagon key, firmly locks the pipe into the fitting. The grub screw is generally manufactured in case hardened steel* and benefits from Kee Koat® protection against corrosion. This combined with the ThreadKoat® (patented) factory applied coating for the threaded recesses ensures that Kee Klamp fittings achieve longer life and better corrosion resistance. A Kee Klamp fitting (size 5 to 9) can support an axial load of *2000 lbs (900 kg). per grub screw with the grub screw tightened to a torque of 29 lbs. ft.(39 Nm). * Materials used can vary according to application. Please refer to manufacturer for detailed specification. The information on fittings in this site is comprehensive, and because of the coding system we have adopted, easy to use. Diagrams are shown for each fitting showing entry of pipe, a table of dimensions and a definition of use adjacent to its appropriate Type number (10, 15, 20, 25 etc.). Alongside the Type number is a code (4, 5, 6, 7, etc.) relating to the outside diameter of the pipe for which the Kee Klamp fitting had been designed. The relationship between the Kee Klamp pipe reference and standard pipe outside diameter is explained in the aforementioned chart. Example: (1) A 10-7 is a Type 10 Kee Klamp fitting with both sockets designed to accept a pipe that has an outside diameter of 42.4mm or 1 11/16" (1 1/4" Nominal pipe Size). (2) A 25-9 is a Type 25 Kee Klamp fitting with all three sockets designed to accept a pipe that has an outside diameter of 60.9mm or 2 3/8" (2" N.P.S.). 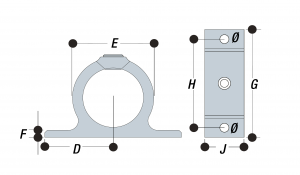 Where more than one pipe reference is shown alongside a particular Type number, it indicates that the individual sockets are designed to accept different sizes of pipe. In a multi-digit code number the first figure relates to the 'A' socket and the second to the 'B' socket. Example (3) A 45-76 is a Type 45 Kee Klamp fitting with 'A' socket accepting a pipe that has an outside diameter of 42.4mm or 1 11/16", and a 'B' socket accepting a pipe/pipe that has an outside diameter of 33.7mm or 1 11/32". While Kee Industrial Products can give a general guidance relating to the use of each Kee Klamp fitting detailed in this site, the nature of the product means that the ultimate responsibility for selecting the correct fitting for an application must lie with the customer. The customer should also ensure that the existing structure to which the Kee Klamp construction is being secured, is of sufficient strength to support both the self weight of the Kee Klamp construction and the imposed loads applied, including wind loads, snow loads, and any other superimposed loads. For uneven load distributions or single spans, the required pipe size must be determined by standard bending moment calculations assuming a Kee Klamp joint to give a simply supported beam. The table shown below gives an indication only of the safe load uniformly distributed, in kg, that may be carried per shelf consisting of front and back pipes when used as continuous beams. Recommended set screw torque: 39 Nm. At loads greater than 900 kg, consideration must be given to grub screw slip. Exhaustive tests on samples of standard size 7 Kee Klamp fittings were performed by an independent research laboratory. The purpose of the test was to evaluate the use of either standard set-screws or self-locking set screws. A "Tee" section test assembly was made using three 300mm lengths of galvanized 1 ¼" standard pipe held together by a socket Tee fitting (Type 25-7). The vertical leg of the test assembly was supported in a standard railing flange (Type 62-7). The completed assembly was then rigidly attached to the vibration table. The test assembly was initially assembled using standard grub screws and tested in the configuration. The standard grub screws were then replaced with self-locking grub screws and the tests repeated. The test was conducted on a Ling 667 kg Electromagnetic vibration table. The table was programmed to perform a resonance search between 25 and 350 Hz. The following table details the resonant frequencies that were recorded. During the resonance search amplification factors, Q, were measured at each resonant frequency, the point of reference being the end of one horizontal pipe. The table was then held at one of the resonant frequencies, set in motion with a controlled acceleration level of 4g, and run for a period of six hours. This was repeated for three more resonant frequencies in descending order of "Q" factor. During the twenty-four hours of vibration at the four resonant frequencies above no signs of loosening with either type of set screw occurred. In what countries are Kee Klamp fittings available? What are Kee Klamp fittings used for? With Kee Klamp fittings, you can build various tubular structures such as railing, racking, retail store fixtures, soft contained play systems, awning, fencing, machinery framework, and 1001 other applications. What is a Kee Klamp structural pipe fitting? Kee Klamp slip-on pipe fittings are cast-iron pipe fittings, which conform to BS EN 1562/1563, SAE J158 A grade M3210, ASTM A47-77-32510. Kee Klamp fittings are used in conjunction with steel pipe to build structures of unlimited size and scope. Casehardened grub screws attach the fittings securely around the pipe. There is no welding or drilling required when building with Kee Klamp fittings. Kee Klamp fittings are galvanised, making them ideal for indoor or outdoor use. The only tools required for building Kee Klamp structures are a pipe cutter and a standard hex key. What style or types are available? Over sixty styles of Kee Klamp fittings are available to meet almost any structural pipe needs. Visit our Online Catalog to view the available styles and types. 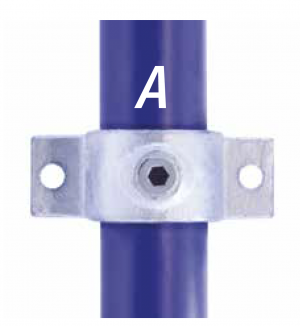 Are there Kee Klamp fittings available to modify or extend an existing pipe structure? Yes, Kee Industrial Products has designed several add-on fittings for retrofitting existing tubular structures. Please call or email us with your specific need. How do I install Kee Klamp fittings? Installation instructions are available for Download under our "Resources" section, or by contacting us directly and requesting instructions. What about the fittings being tampered with? Grub screw inserts are available to deter tampering with a finished Kee Klamp structure. What is the recommended torque for the grub screws? When constructing with Kee Klamp fittings we recommend that you tighten the grub screw to 29 lbs./ft. or 39 Nm. This is approximately "hand-tight." What size hex key is used with Kee Klamp fittings? Size 4 fittings use a 3/16" (4.76mm) A.F. (Across Flat) hex key, while Sizes 5 and 6 use a ¼" (6.35mm) A.F. hex key. Sizes 7, 8, and 9 fittings use a 5/16" (7.94mm) A.F. hex key. Will Kee Klamp fittings rust if used outdoors? Kee Klamp fittings are galvanised to BS 729 (ISO 1461) and ASTM A153 which can last for over 30 years. Kee Klamp grub screws are treated with our Kee Koat® corrosion protection. The fitting recesses are also coated with our factory applied, ThredKoat®(patented), corrosion resistance. Are Kee Klamp fittings available with alternative finishes? Besides the long lasting galvanised finish, Kee Klamp fittings can be powder coated to any RAL color. Can different sizes of tube be used when building tubular structures with Kee Klamp fittings? Yes, Kee Industrial Products has designed several of its fittings with multiple sized barrels to allow for the utilization of different sizes of pipe when building tubular structures. View our "Tech Spec" section to the left, or Download a Catalog, for a pipe size chart. What are the structural design specifications when building with Kee Klamp fittings? An independent laboratory has tested Kee Klamp fittings on terms of load capacity and vibration resistance. Using these results, we have developed a series of structural design guidelines that must be followed when building with Kee Klamp fittings. These can be found in the "Tech Spec" section to the left. What quality certifications has Kee Klamp attained? The core Kee Klamp fittings have attained TUV certification. You may view our qualified certifications to the left under the "Certifications" section. What type of pipe can be used with Kee Klamp fittings? Kee Klamp fittings are designed for use with Schedule 40 or 80 steel pipe. View our "Tech Spec" section to the left, or Download a Catalog, for a pipe size chart. Which sizes of pipe can I use with Kee Klamp fittings? 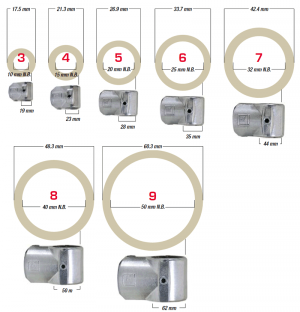 Most styles of Kee Klamp fittings are available for nominal tube sizes ½" I.D. (13.5mm OD) to 2" I.D. (60.3mm OD). View our "Tech Spec" section to the left, or Download a Catalog, for a pipe size chart. Here are the appropriate Certifications that pertain to the tested Kee Klamp fittings. These certifications will vouch for Kee Klamp fittings quality, durability and reliability. Each certification is in PDF format, and can be downloaded for your convenience. In this section you will find important Safety Information pertaining to the proper use, care, and assembly of Kee Klamp fittings. It is critical to review this information before and during the use of Kee Klamp fittings. 200-6 0.18 lbs. 6 1.77 in. 1.77 in. 0.20 in. 3.54 in. 2.8 in. 0.98 in. 200-7 0.84 lbs. 7 2.09 in. 2.17 in. 0.24 in. 4.17 in. 3.39 in. 1.57 in. 200-8 1.30 lbs. 8 2.20 in. 2.63 in. 0.24 in. 4.41 in. 3.62 in. 1.57 in.